Overall, annual tourism grew by over €1 billion last year compared to 2014. TOURISM IS IRELAND’S largest indigenous employer and last year visitors to the country spent €4.6 billion, according to Fáilte Ireland. That huge spend is spread out across all Ireland’s regions but the Irish Tourism Industry Confederation (ITIC) has collated the figures to see which areas benefit most from tourism. Unsurprisingly, most of the tourist money spent in Ireland is spent in Dublin. Tourist expenditure in Dublin accounts for 43% of all the money spent here and in monetary terms comes it comes in at just under €2 billion. What’s striking about Dublin’s share of the tourism pie is that it has grown each year over the past three years from 38% of the total in 2014. In a commentary on the figures, the ITIC speculates that Dublin’s increasing share of visitor spend may be partly to do with the trend for more city-break travel. The regions are broken down into the seven different regions that are used by the CSO and in those terms the southwest, comprising Cork and Kerry, has the second-largest spend by tourists. Those two countries together raked in €849 million last year, or 22% of the total. The border region, which is made up of the five counties bordering Northern Ireland plus Sligo, has shown the biggest growth in tourist spend over the three-year period to last year. An increase of more than €100 million was recorded over that period meaning the border region has moved ahead of the south east in terms of where tourists spend their money. Fáilte Ireland has also put together an updated list of the most popular tourist attractions in the country, both paid and free. The Guinness Storehouse remains the most popular place for tourists to visit with a total of 1.65 million visitors last year. The Cliffs of Moher was the second most popular with 1.43 million visits. The National Gallery of Ireland was the most popular free attraction and was the seventh most popular overall. The most popular tourist attractions in the country. 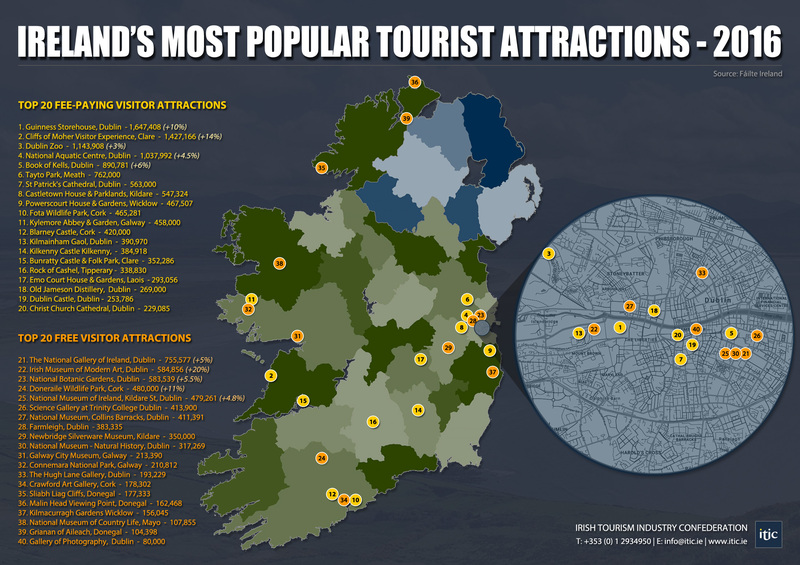 Source: Irish Tourism Industry Confederation. Email “Ireland's most popular tourist counties and attractions have been revealed”. Feedback on “Ireland's most popular tourist counties and attractions have been revealed”.